What Your Child Will Gain From a CISV Programme? While we put an emphasis on fun and friendship, at the core of everything we do is our aim to educate and inspire young people to realise their full potential. The curriculum in each of our programmes is age-appropriate and delivered using our informal, ‘learning by doing’ approach. We will help your child to develop an ‘anything is possible’ attitude, leadership and communication skills, and an understanding of the world around them. Do You Want to Send Your Child to a CISV Programme? The first step is to find your CISV National Association. They will be able to tell you about CISV programmes they are hosting or taking part in and put you in touch with your nearest CISV Chapter. CISV has over 60 years experience of organizing camp-based programmes for children and young people. You can be assured of the high quality of supervision and care we take with our youngest participants. Is your child attending a CISV programme? Look in Resources for all the forms, documents, and information you need. 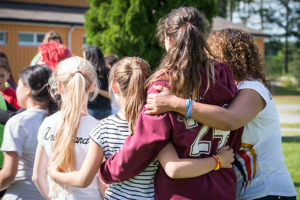 Going to a CISV camp abroad for up to a month is an exciting prospect for the children who will participate – but perhaps a little daunting for their parents! We understand. We know that you want to be sure that your child will be looked after and kept safe before, during, and after the programme. CISV is committed to ensuring that the safety of each child in our care is paramount. We have been organizing camp-based programmes and family-hosted exchanges for decades and child safety and protection remain our highest priorities. Many of our volunteers are parents themselves who are sending their children to CISV programmes in other countries – or may have done so in the past. They share our commitment to, and your concern for, the welfare of your child. CISV International has comprehensive Child Protection Policy and Procedures, which are reviewed and updated regularly. Our National Associations additionally have their own child protection procedures, which are in line with their national legislation and requirements. All of our programme staff and leaders receive child protection, risk management, and leadership training to prepare them to take care of your child. A full risk assessment is conducted at the start of every programme and our programme staff are supported by our local, regional, and international network of experienced Risk Managers. At every programme there is a qualified first-aider. They are responsible for any basic first aid, the organization and distribution of medicines, liaising with local doctors and hospitals as necessary, and keeping all records relating to any illness or accident. Participation in one of our programmes is often a powerful experience – and not just for your child! They will come home with stories to share and may even have changed a little and become more independent. CISV will help to prepare you and your child for the experience of going to a programme, so you all know what to expect. Hearing first-hand from children and parents of children who have already participated is an important part of this process. Inter-cultural experience is enriching for all of your family. If your child is going to be part of an Interchange exchange, your family will all get to take part in the experience as part of the two-way exchange. You may also get the opportunity to host children coming from another country to take part in a camp-based programme near you. The CISV experience stays with you for life. The volunteers that run and support our Chapters and programmes are nearly all parents of children who participated at some time or other. To find put how you can get involved, read more about how you can volunteer. Are you and your family taking part in a CISV programme? Look in Resources for all the forms, documents, and information you need.